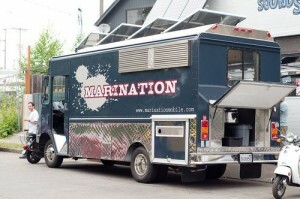 Marination Mobile – Seattle, WA (@curb_cuisine) – Food Truck Talk – Searching for the best foodtrucks! 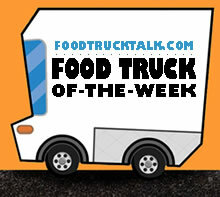 Congratulations to Marination Mobile as FoodTruckTalk.com’s Food Truck Of-The-Week! Kamala is one of the owners of one of Seattle’s most popular food trucks – Marination Mobile She is originally from Hawaii, and has a little bit of Korean in her as well. Her partner is Roz. She is Chinese and Filipina by blood, born in Greece, and raised by a Japanese mom. She lived in Romania for a while as well. It’s clear Marination’s marinades are top notch. 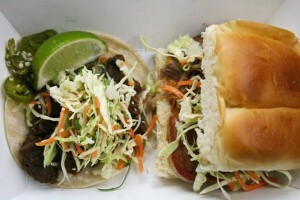 The tacos are stuffed with either pork, ginger-miso chicken, tofu or kalbi and topped with a saucy, tangy slaw. Kalbi is a traditional Korean dish; tender short ribs marinaded in soy, garlic and citrus. It’s salty and sweet! The pork is sliced super thin and marinaded in a rich red pepper sauce. In addition to the tacos Marination Mobile food truck also has sliders filled with pork or SPAM, which is the unofficial national food of Hawaii. 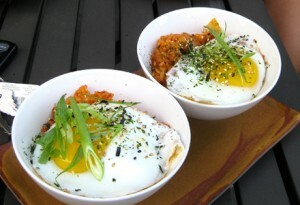 The Kimchi Rice Bowl can be ordered with any of meats (or tofu) and topped with a sunny side up fried egg! Finally, there is the SPAM Musubi, apparently a staple of surfers, it’s a grilled slice of SPAMwith a ball of rice, wrapped in a seaweed blanket. Hmmm, gotta give that a try. Marination Mobile has won a plethora of awards and recognitions, they are certainly serving Seattle with creative and flavorful Hawaiin-Korean food.